· No EME analysis was undertaken in preparing the plans but this has now been done with the result being a requirement to increase the overall height of the tower to 20m. Given this advice the Council is not able to resolve as per the recommendation in the report. If the Council was interested in assessing an application for the Vista Way water reservoir site at the very least the matter would need to be deferred to provide the applicant with the opportunity to lodge amended plans and then the Council would need to readvertise those plans. However the amended development application, which includes a new location for the tower on Lot 3 DP 1147417 - 1079 Scotts Head Road, Scotts Head from what was originally proposed on that lot, is an acceptable alternative and in response to the advice from Optus it is recommended that Council now approve the proposed telecommunications tower on this site. NOTE: This matter requires a “Planning Decision” meaning a decision made in the exercise of a function of the council under the Environmental Planning and Assessment Act 1979 including a decision relating to a development application, an environmental planning instrument, a development control plan or a development contribution plan. Under Section 375A of the Local Government Act 1993 it requires the General Manager to record the names of each Councillor supporting and opposing the decision. That Council as the consent authority, pursuant Section 4.16 of the Environmental Planning and Assessment Act 1979 (the Act), grant consent for Development Application 2017/179 for the construction of a telecommunications facility on Lot 3 DP 1147417 - 1079 Scotts Head Road, Scotts Head subject to the conditions contained within the attachment. 1. The Council has now had the opportunity to consider four (4) alternative sites for a telecommunications facility for Scotts Head. This process has demonstrated that any and all potential sites will attract some level of objection and this is certainly the case with the Vista Way site. 2. The first development application DA 2016/147 (subsequently withdrawn) for a site at the rear of Buz Brazel oval was submitted 1 September 2016 so the matter has been on-going for an extended period. 3. Council has received many representations indicating the need to improve mobile phone/wireless communications in Scotts Head, the urgency for which will only increase as more people rely on the wireless network for their daily voice and data needs. The poor wireless service at Scotts Head is a disincentive to economic development and investment in the town. 4. The poor wireless service at Scotts Head is a potential safety risk for residents. 5. The applicant’s preference is for the Scotts Head Road site and it is agreed that in assessing visual impact, whilst this tower will be approximately twice as high as a tower on the Vista Way reservoir site, the Vista Way reservoir site is in a residential area. B. Refuse consent to the development application and provide reasons for same. “I understand you plan to recommend to Council that they approve the Vista Way water reservoir site for the planned Optus and Telstra mobile phone tower at Scotts Head. I am surprised by this recommendation. I acknowledge that there is some visual impact from the currently proposed site in Scotts Head Rd. However, in my view, the visual impact from a site adjacent to the water reservoir would be far greater. The tower at Vista Way would be considerably shorter. However, it is immediately adjacent and essentially unscreened from a relatively large number of houses. The Scotts Head Rd site is, on the other hand, well removed from the nearest house, partially screened by dense vegetation and in my assessment, directly visible from a far smaller number of houses. It is also worth noting that the Scotts Head Road site delivers a superior RF, (i.e. mobile coverage), outcome. However, the Vista Way location will deliver an acceptable RF outcome and, In the scheme of things, the difference is not critical. Either way, the desired coverage objectives will be essentially delivered. Accordingly, if Council decides to adopt your recommendation, Optus will accept this decision and subject to the issues I raise below, will build the mobile phone tower at Vista Way. It is for this reason that we have now formally lodged a DA for the Vista Way site. I can also confirm that Telstra will also accept the Vista Way site. They hold similar views to mine, but are willing to co-locate on an Optus tower at Vista Way. However, given your recommendation I wish to bring the following issues and concerns to your attention. Firstly and most importantly, for the reasons I have outlined above, Optus have never considered the Vista Way site as a serious candidate. Accordingly, whilst we submitted a draft site layout and an elevation plan for the Vista Way site, with the current DA amendment for the Scotts Head Road site, at Council’s request, it was provided to allow an assessment of the potential impact of a site at this location. It was not submitted as an alternative application. We are yet to undertake a detailed engineering assessment of the Vista Way site and therefore cannot guarantee that the final design will reflect the draft site layout. An engineering site survey has not been undertaken. There has been no Geotech investigations, nor any services/utilities investigations. Logically, for example, there are major water mains at this site and the pole location, (which require a large and deep footing/foundation), may need to be substantially altered to avoid these water mains. Similarly, the Geotech investigations may require the site layout and location to be changed. Similarly, given that the plans were indicative, no EME analysis was undertaken in preparing these plans. Given your recommendation, we have now done so and established that a 15m high tower is not appropriate. For a range of technical reasons, there needs to be a 5m separation between Optus’ and Telstra’s antennas. This means that Telstra’s antennas would be 10m above ground level and at this height, the EME exclusion zones extending out from Telstra’s antennas will reach some of the surrounding trees and power lines. To overcome this problem we need to increase the overall height of the tower to 20m. This will mean that Telstra’s antennas are at 15m, overcoming all possible EME compliance issues. This height increase will also improve the RF outcome, especially for Telstra. Lastly, I understand Council owns the Vista Way site. Accordingly, for the installation to proceed, it will be necessary for Optus and Telstra to enter into commercial agreements/leases with Council. The commercial and legal terms of these agreements will need to be satisfactory to all parties for the site to proceed. In this regard and on a positive note, I do note that Optus already has an number of mobile telephone base stations located on Nambucca Shire Council properties. Provided that the terms and conditions of any lease at Vista Way reflected the terms and conditions of these existing leases, there should not be a problem, at least for Optus. Given this advice the Council is unable to resolve as per the recommendation in the report issued with the business paper agenda. If the Council was interested in assessing an application for the Vista Way water reservoir site at the very least the matter would need to be deferred to provide the applicant with the opportunity to lodge amended plans and then the Council would need to readvertise those plans. However the amended development application, which includes a new location for the tower on 1079 Scotts Head Road from what was originally proposed, is an acceptable alternative and in response to the advice from Optus it is recommended that Council now approve the proposed telecommunications tower on this site. The planning assessment information concerning the site at 1079 Scotts Head Road has not been repeated in this late report as it is contained within the earlier report in the business paper. This late report has been discussed with the Manager Development & Environment. 1. The development is to be implemented in accordance with the plans endorsed with the Council stamp, dated TBC, and set out in the following table except where modified by any conditions of this consent. In the event of any inconsistency between conditions of this development consent and the plans referred to above, the conditions of this development consent prevail. 2. In the event the development is not required to be operational, it must be removed and the site restored to its predevelopment condition. 3. This development consent only permits the erection of a telecommunications facility at Lot 3 DP 1147417 - 1079 Scotts Head Road, Scotts Head. No approval is given to the erection of a telecommunications facility at Lot 2 DP 231485 – Vista Way, Scotts Head. 4. This development consent does not permit the extension of the electricity supply network to the development by any means other than via the existing access track from Scotts Head Road to be used to access the development. (a) Not exceed 5dB(A) above the background noise level (LA90), between 7am and 10pm on any day, when measured at the boundary of the premises and in the absence of the noise source under consideration. (b) Not exceed the background noise level (LA90), between 10pm and 7am on any day, when measured at the boundary of the premises and in the absence of the noise source under consideration. Measurements are to be carried out in accordance with the NSW Industrial Noise Policy and corrections are to be made to the above criteria for intermittent, tonal, impulsive and low frequency noise. · That it does not penetrate any obstacle limitation surface shown on any relevant Obstacle Limitation Surface Plan that has been prepared by the operator of an aerodrome or airport operating within 30 kilometres of the proposed development and reported to the Civil Aviation Safety Authority Australia. Note: See the Advisory Circular 139-08(0) entitled Reporting of Tall Structures issued by the Civil Aviation Safety Authority Australia in 2005 concerning this condition. Appointed a contractor for the building work who is the holder of a contractor licence if any residential building work is involved, notified the PCA of any such appointment, and notified the contractor of any critical stage inspections and other inspections that are to be carried out in respect of the building work. (c) The person having the benefit of the development consent has given Council written notice, at least two days prior to work commencing on site, of the name and details of the PCA and the date construction work is proposed to commence. 8. All care is to be taken to ensure the safety of the public in general, road users, pedestrians and adjoining property. A minimum of $20 million public liability insurance cover is to be maintained for the duration of the construction of the development. Council is to be nominated as an interested party on the policy. Council is not to be held responsible for any negligence caused by the undertaking of the works. 9. The construction of the proposed tower is to be reported to the Aeronautical Information Service (AIS) of the Royal Australian Air Force (RAAF) in accordance with the Civil Aviation Safety Authority circular 139-08 reporting of tall structures. Note: The report can be made at the following website https://www.raafais.gov.au/frame.htm?obstr_form2.htm. c Silt fence or sediment barrier. 11. A sign must be erected on site in a prominent position containing the information prescribed by Clause 98A (2) of the Environmental Planning & Assessment Regulation 2000 being the name, address and telephone number of the Principal Certifying Authority for the work, and name of the principal contractor for the work and telephone number on which that person may be contacted outside working hours, and stating that unauthorised entry to the site is prohibited. This sign must be maintained on site while work is being carried out and removed when the work has been completed. 12. All building work must be carried out in accordance with the requirements of the Building Code of Australia as in force on the date the application for the relevant construction certificate was made. 13. Any works involving the generation of noise which extends beyond the boundary of the land, other than works required in an emergency to avoid the loss of life, damage to property and/or to prevent environmental harm, shall only be carried out between 7:00 am and 6:00 pm Monday to Saturday inclusive. No works shall occur on public holidays. 14. A copy of the approved Construction Certificate including plans, details and specifications must remain at the site at all times during construction. 15. All builders rubbish is to be contained on the site in a ‘Builders Skips’ or an enclosure. Building materials are to be delivered directly onto the property. Footpaths, road reserves and public reserves are to be maintained clear of rubbish, building materials and all other items. 16. Sediment and erosion control measures must be maintained at all times until the site has been stabilised by permanent vegetation cover or hard surface. (b) Where necessary, underpin the adjoining premises to prevent any such damage. 18. The development is to proceed with caution. If any Aboriginal objects are found, works are to stop and the NSW Office of Environment and Heritage (OEH) notified. If human remains are found work is to stop, the site is to be secured and the NSW Police and OEH are to be notified. Note: Council requires a minimum 48 hours’ notice to undertake each inspection. Inspections are done on a Tuesday or Thursday between 7.30 – 12.00 and 1.30pm - 3.30pm preferably. Inspections outside these times can be arranged in liaison with Council. You will need to quote your development application number when contacting Council to arrange an inspection and ensure all fees have been paid and a Certificate of Currency for Public Liability in the name of the company and/or person doing the work has been supplied to Council. 20. The work is to proceed as quickly as reasonably possible and is to be done in such a manner that the minimum of inconvenience to pedestrian or vehicular traffic is caused and care must be taken for pedestrian safety both during and after construction. Where any of the work involved in constructing the access is carried out on the roadway, appropriate signage and traffic control is to be provided. Applicants are to be familiar with and conform to the requirements of AS1742.3-2002, Traffic Control Devices for Works on Roads and in particular any traffic controllers are to possess a Traffic Control (Flagman) Certificate. Any works on a Public Road Reserve are classified as High Risk Construction as defined in the Work Health and Safety Act 2011. All works is to be carried out in accordance with this Act and Work Health and Safety Regulation 2011 copies of which may be obtained from WorkCover. For the purposes of the Work Health and Safety Act 2011 “the applicant” will be the Principal Contractor. 21. The development shall not be used or occupied until an Occupation Certificate has been issued by the Principal Certifying Authority. 22. All of the works indicated on the plans and granted by this consent, including any other consents that are necessary for the completion of this development, are to be completed and approved by the relevant consent authority/s prior to the issue of an Occupation Certificate. 23. 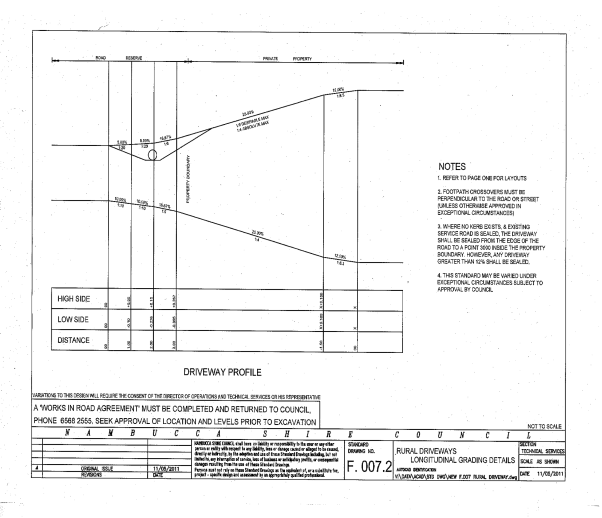 Prior to the issue of an Occupation Certificate or use of the development (whichever occurs first), construct a driveway in accordance with Council’s “Requirements for Rural Driveway Construction” plans, drawing numbers F.007.1 and F.007.2 (attached), or in accordance with any other approval granted by Council. 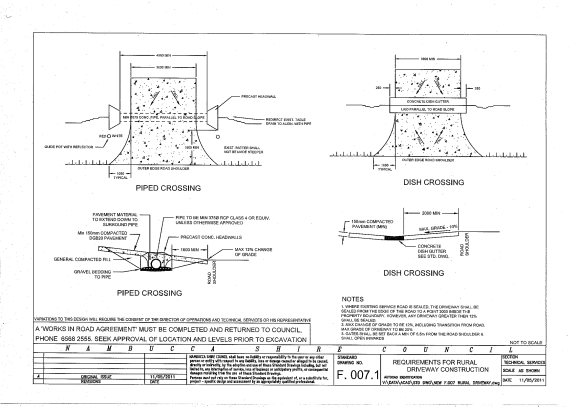 Note: Where the existing road is sealed, the driveway must also be sealed from the edge of the existing road seal to 3m within the subject land. 24. External building materials are to incorporate the use of a muted, natural colour that will blend with, rather than stand out from, the landscape. · A report showing compliance with the Australian Communications Industry Forum Industry Code entitled CIF C564:2004 Deployment of Mobile Phone Network Infrastructure. At the commencement of building works and for the life of the development, the land for a distance of 10m around the development shall be managed as an inner protection area as outlined within Section 4.1.3 and Appendix 5 of ‘Planning for Bushfire Protection 2006’ and the NSW Rural Fire Service’s document ‘Standards for Asset Protection Zones’. Electricity supply is to comply with Section 4.1.3 of ‘Planning for Bushfire Protection 2006’. Property access roads shall comply with Section 4.1.3(2) of ‘Planning for Bushfire Protection 2006’. 27. Where any damage occurs to Council’s infrastructure during construction, the principal contractor shall replace or make good the damaged infrastructure before the occupation certificate is issued. (c) is consistent with the aims and objectives of Council’s Development Control Plans, Codes and Policies. · To ensure the protection of the amenity and character of land adjoining and in the locality of the proposed development. · To minimise any potential adverse environmental, social or economic impacts of the proposed development. · To ensure that all traffic, car parking and access requirements arising from the development are addressed. · To ensure the development does not conflict with the public interest.